With nature starting to bud, and the sun seeming to have dusted off his hat, the feel of better weather is certainly in the air. This means that we now have no excuse to be driving round in a filthy car. Hopefully you have all made the effort and are feeling better for it. After over 18months of searching I have finally managed to find a leather interior, and boy was it worth the wait!! Although I am now not looking forward to the burning legs during the summer, for now though I am a happy bunny. February saw UK Passats again smash through the 6million hits barrier. We are now sporting over 6,300 members, with 490 new users signing up in the first 24 days of February. Our presence hasn't gone unnoticed by the magazines too. Golf+ are now seeking a feature about UK Passats. We really are going from strength to strength. 2011 sees the 6th birthday of UK Passats so this has been a long, hard road for all involved, but we are not planning on stopping anytime soon, and hope you are going to continue to be a part of this great forum. March will see the first big show of the year, Ultimate Dubs. For those of you lucky enough to be going, I hope you have a great time. If you are not on the UKP stand, please make sure you pass by and say hello. Remember those of us who are not going are relying on you all to share you snaps upon your return, therefore don't leave us hanging to long. May I just say a huge thanks to the current sponsors of the site , without their financial commitment we could not keep the site alive. Please see below for details of a great offer from Autosessive. Rest assured the Admin team will be working with the UKP sponsors to keep bringing you all more superb offers. Whatever plans you have for March, I hope you have fun and don't forget to keep us all upto date with any mods or adventures you have. Normally the Car Of The Month race is a close one, not this month though. Guyke took it by a landslide. This B6 is fairly fresh car to the forum, but what a car. Guyke is from Belgium and seems to have created a car that pushes so many buttons, for so many people. 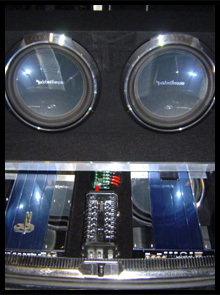 From the huge sound system, to the truly awesome static stance, from the 19" rims, to the R-Line kit. Is it any wonder he took the title of COTM? The nominations for March Car Of The Month have begin, click here to make your voice heard. 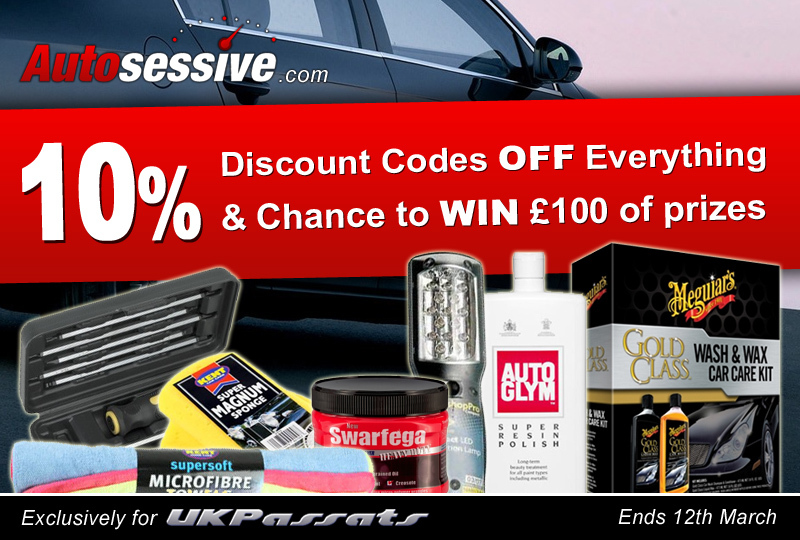 UK Passats has teamed up with Autosessive.com, a brand new website for the real car enthusiast. Better still, there’s also the chance to win £100 of Car Accessories from the site. Enter any of the codes below into the Shopping Basket for the 10% Discount. One of the codes will also result in you being entered into a Prize Draw to win £100 of Car Accessories. The winner will be randomly selected. The offer ends 12th March. Good luck! Forum upgrade to latest version went well and all is working well. Guest login changes are under test and should be in place 2nd week in March. At GTIracer’s suggestion he asked for all links to work the same i.e. to open a new tab rather than overwriting the current tab. I am cleaning up the board to make it do this (Glacier and Charcoal styles only). However that left the links you guys put in posts. So I have invented some new code for you. If you want to have your link to another site display as a name and in a NEW TAB you will see there is a new function in the top of the posting window called "newtab". To use it click on it and [newtab][/newtab] will appear. Now inside the two fields (i.e. between the ][ ) enter URL|Name where URL is the copied URL of the page you want to see, "|" is character in the bottom left of your keyboard above "\", and Name is the text you want to display. will display a link in your post called BBC and when that link is clicked on it will display the BBC Rugby page in another tab. This should work for any URL i.e.Ebay etc.